Handwashing is your best defense against the flu! Fill your forms out online before you come to the office! Click on one of the buttons below to be directed to the appropriate form. Fill it out at your convenience and save time at your office visit! A tradition of quality pediatric care delivered in a more comfortable and personal manner. Since Dr. Rick Glover established this pediatric practice in 1996, it has grown and changed quite a bit. In 2002 a new name was adopted, Children's Faith Pediatrics. This name reflects a new vision and approach to the practice, recognizing our need for an unquestioning, child-like faith in God. 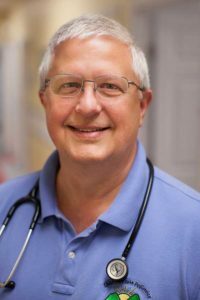 In early 2001 Dr. Glover was involved in a mission project in which an infant from Belize, Central America came to Knoxville at 13 days old for removal of a large, life-threatening tumor. Although she died after the operation at just 19 days old, God used baby Faith to touch many hearts and change many lives. To honor baby Faith and all the other precious children we have cared for, we renamed our practice Children's Faith Pediatrics. We hope you will be reminded of your need for child-like faith in God each time we use this name. Our logo represents the fresh new beginning we receive as a blessing each day as the sun rises because of the empty cross at the top of the mountain. Our prayer is that we help your child with their medical needs while encouraging your family to draw closer to the Great Physician, Jesus himself. Dr. Glover grew up in West Knoxville, attending Cedar Bluff and Farragut schools. After graduating from the University of Tennessee at Knoxville, he attended medical school at U.T. in Memphis. His residency training in pediatrics was at LeBonheur Children’s Medical Center in Memphis. He served three years active duty at Columbus Air Force Base, where he was Chief of Pediatrics. Dr. Glover is married and has four daughters and several grandchildren. Dr. L. David Perry was born and raised in Florida. After graduating from the University of Alabama, he attended the University of South Florida College of Medicine. His pediatric internship and residency was completed at the University of Alabama at Birmingham. 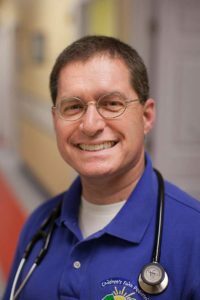 He joined Children’s Faith Pediatrics in 2005 after practicing in North Knoxville for seven years. Dr. Perry is married and currently has four children.